Combine the best features of a road bike, touring bike, and mountain bike and you get a general-purpose bicycle that rides well in most riding conditions. Hybrid bikes are popular with casual riders, commuters, and children because of they are comfortable, stable, and easy to ride. Typically, the hybrid bikes have flat, straight handlebars, and a mountain bike saddle. Hybrid bikes are lightweight with thin wheels and smooth tires. Hybrid riders will be able to take the bumps and get good speed too. Much like a touring bike, hybrid bikes often have features that allow for mounting racks and bags, but aren't great mountain bikes. 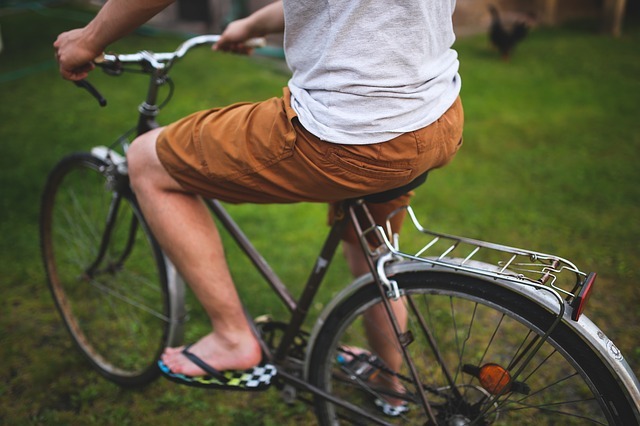 You’ll get the most enjoyment out of a bike when you think about how you will use it. If you plan to ride with friends, you’ll want to get something similar to what they ride so that you can ride about the same speeds. Beyond that, you’ll want to decide how many gears you want, what kind of saddle you prefer, and if you want a front wheel suspension or full-suspension bike. If you had a bicycle as a child, you probably had a road bike. Road bikes are designed to be ridden fast on concrete or pavement. You can ride them on unpaved trails, but they’re not as steady. Since they’re built for speed, they have smooth, skinny tires and a dropped handlebar. Hybrid bikes suit most riders well because they ride well on paved and unpaved trails, but they’re not as lightweight or as efficient as road bikes. While they ride great on most surfaces, they won’t stand the rigors of off-road mountain biking. Hybrid bikes are comfortable to ride because of the large, padded seats and upright handlebars. Choose a hybrid bike for casual riding, short-distance community, and for short jaunts around the community. With an aluminum frame and linear pull brakes for safe stopping, this hybrid for men has 21-speed Shifters and Derailleurs, so it’s great for running errands around town or for longer rides on the trails. It is equipped with low-profile, high performance, 26” tires for a smooth ride. It has resin cage pedals. Ancheer makes this 21-speed hybrid bikes that gets you around town and gets up to speed on longer treks. The aluminum and carbon steel frame is lightweight and sturdy. Sit atop the comfortable synthetic leather saddle that is styled for athletic riding. Brake smoothly with the front and rear hand brakes. Roadmaster offers a hybrid bike with 18-speed twist shifters and derailleurs. It has a strong, steel multi-sport frame and 3-piece crank for a wide gear range. Ride the roads or the trails while straddling the standard trim, athletic-style saddle. Come to a smooth stop with the front and rear handbrakes. Riders 5’4”-6’2” will love this hybrid! Women will want to ride this hybrid to school, work, or for shopping around the town. The Schwinn Wayfarer hybrid has a steel urban-style frame with 7-speed shifters and a Schwinn rear derailleur. It has a Schwinn spring seat for riding upright. You can’t go wrong with this hybrid—it has a lifetime warranty as long as you own the bike. Comfort rules the day with this hybrid bike with an aluminum city-style frame. It has 21 speeds and a front suspension fort that reduces fatigue on arms and hands. It has linear pull brakes. Carry your purse, shopping bags, and backpack on the rear gear carrier. It has a swept-back, upright handlebar and a padded saddle. This hybrid bike for women won’t take the trails as well as mountain bikes, but it’s a great little ride for recreational use or commuting. It has a comfortable, upright riding position and a lightweight aluminum frame. With 21 speeds, you can get some speed going when you need to and you can store your personal items on the rear gear rack. When you bike for short errands, commuting, or for occasional pleasure rides, the hybrid bike is a fabulous choice. Get a bike with 3-7 gears if you know you don’t need more than that, but there are plenty of reasonably-priced hybrid bikes with 18-21 gears that will get your speed going when you want to. Hybrid bikes are some of the most versatile bikes you’ll find.